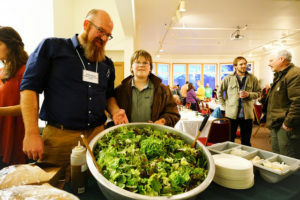 Share lessons learned and techniques for overcoming challenges of growing food in Southeast Alaska. Learn specific skills, technology, and research that contribute to commercial farming success and efficiency in this unique region. 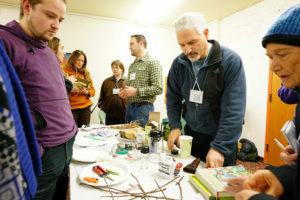 Connect with new and experienced farmers to build an inspiring network! THANK YOU to all who presented, supported, attended, and participated in the 2017 Southeast Alaska Farmer Summit! 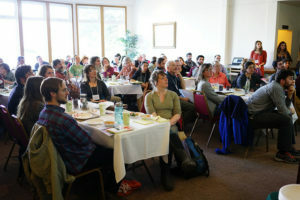 We were thrilled to have over 80 people attend and 13 communities represented at the 2017 Southeast Alaska Farmers Summit. Thanks again to the community Haines for the wonderful hospitality. We were able to squeeze a lot into one weekend, some of the presentations from the weekend can be viewed in this folder. If you have not already filled out the Summit Evaluation, please take a few moments to provide some feedback. The Evaluation can be filled out online here. It should only take a few moments and will be helpful for planning the next Farmers Summit, which will take place in 2019. Are you interested in developing biomass and/or a greenhouse in your school or community? The Sustainable Southeast Partnership is hosting a tour on Prince of Wales Island to visit the Southeast Island School District’s successful biomass greenhouse systems on April 13th. Please pass along this information to people in your community and school who might be interested. Questions can be directed to Shaina Kilcoyne, s.kilcoyne@realaska.org, 907-331-7409. Bethany Goodrich, Communications Director for the Sustainable Southeast Partnership, snapped some great photos of the weekend. Check them out here. Additionally, the Haines radio station wrote a story with some snippets from the Summit, here. The word-cloud below was generated by grouping similar ideas that were written down by individuals in this breakout session. Phrases and words that appear more prominently were reported more frequently. In this session there were some practical solutions suggested, some include changes to policies. We are evaluating what practical actions we can take to make some meaningful impact in these areas. We will be in touch with how you can be involved in this discussion in the future. he mentioned some research he completed with nitrate test strips. There was some interest in these strips by several growers for various purposes. During his presentation, Doug said the test strips were called “QMQuant”. They are actually MQuant™ strips and are available from VWR or Cole-Palmer. Special thanks to presenters, volunteers, sponsors, the Pilotlight, and Mountain Market!